By RichardC and has no comments yet. 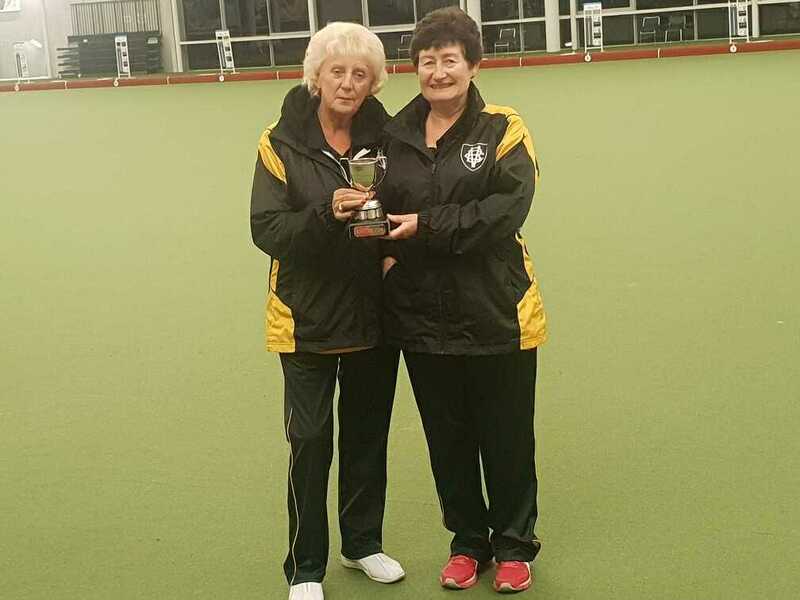 Well done to the Victoria club’s performances during the Wellington Easter 2-4-2 Pairs at the weekend! 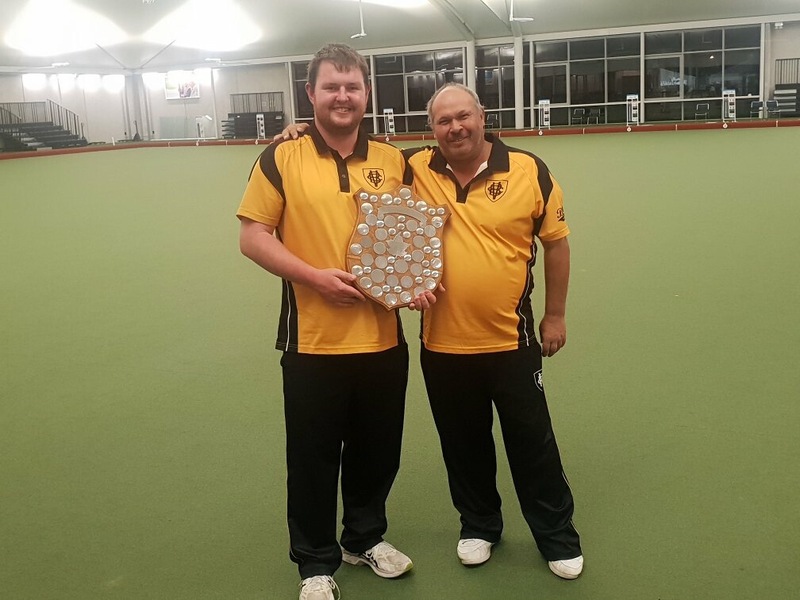 It became a Victoria benefit with Tim Toomey and Mark Noble taking out the men’s title beating Wilton’s Bruce Miller and Ben King 16-5 in the final; and an all-Victoria final in the women’s event! Robyn Rintoul and Nina De Munnik beat clubmates in the semifinal and final taking out Sarah Taukamo and Helen King 12-11 in the semi and then Leigh Griffin and Kay Carr 14-11 in the final. Robyn lost her first four Wellington finals before she could win a Centre title breaking her duck just last week in the Champ of Champ Triples but when it rains it pours with a second in a week! This was Nina’s 6th title after completing her Gold Star in the Xmas Open Fours. 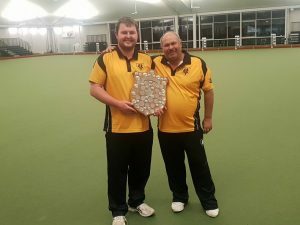 Tim claimed the 4th Wellington Gold Star of the season for the club with his 5th Wellington title while Mark earned his 13th title – the first for 11 years! The title looked theirs after a decisive five shots in the 11th end. 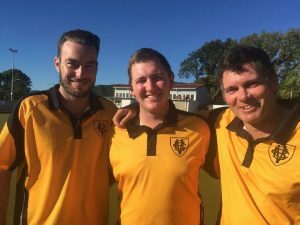 Tim and Mark had earlier beaten Mark Burgess and James Fairhall in the quarterfinal. 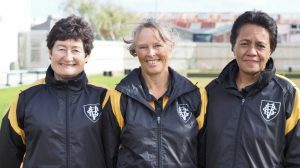 With three of the four semifinalists, Victoria has charged back into contention for the women’s Wellington club of the year title. By our unofficial count there are four clubs that could win going into the Champ of Champ pairs weekend! Victoria will likely finish 3rd in the men’s which has already likely been won by Naenae. 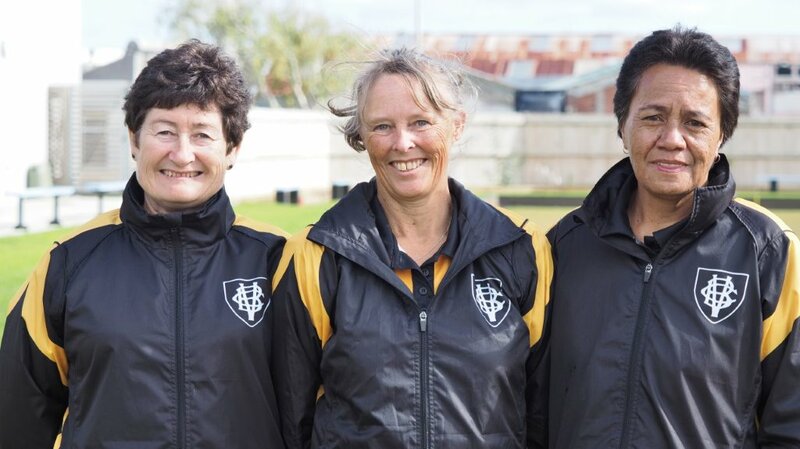 Congratulations to Robyn Rintoul, Sarah Taukamo and Helen King for winning the Wellington Champ of Champ Triples title at Naenae over the weekend. They had to battle hard to get to the final with a 14-13 win in their first match and they came back from 5 behind with 2 ends to play to force an extra end in the semifinal against Silverstream, but had the final all to themselves blowing away Wendy Mackie’s Naenae team 18-6 with 4 ends not played. This was Robyn’s 1st Wellington title, Sarah’s 2nd and Helen’s 27th! Our men’s triple are also still in the hunt awaiting a semifinal against Hutt on Wednesday night 5.30pm at Naenae. The team of Mike Sood, Laurie Guy (a replacement for Richard Corry) and Jeremy Kydd also accounted for Naenae on their way to the semifinals. After several y ears developing their research discovery into a commercialisable product, two Victoria University of Wellington physicists have now launched their own company and attracted $600k of startup capital from New Zealand’s Innovation Agency, Callaghan Innovation, and WNT Ventures. The scientists, who are based at the University’s School of Chemical and Physical Sciences, were experimenting in the lab when they discovered a new and simpler way to analyse ‘cloudy’ solutions. 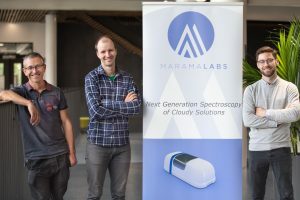 As a result, they developed the first MaramaLabs product—CloudSpec—a novel spectroscopy instrument that enables opaque and cloudy liquids to be analysed more quickly and accurately than traditional spectroscopy methods. Viclink Commercialisation Manager Ashwath Sundaresan says that while there is clear market potential for CloudSpec in a range of industries—including quality assurance for wine, beer, dairy and environmental testing—development had reached a turning point. “Start-ups that commercialise complex intellectual property are often capital-hungry, and require substantial up-front investment in order to develop their products and businesses. Ashwath says that WNT Ventures has provided MaramaLabs with that additional capital—through a combination of their own investment funds and $450,000 via Callaghan Innovation’s Repayable Loan Scheme—to help the company build towards sustainable revenues. “They’re also providing the support that pre-revenue, innovative technologies and companies need to grow into successful businesses,” says Ashwath. Alongside this investment, MaramaLabs has been able to access further capital via the recently announced Booster-Viclink partnership. And while MaramaLabs is already working with two major wineries in New Zealand and Australia, Brendan says the new investment means they can start employing the key operational skills and expertise they need to grow a globally competitive hi-tech business. With the wine industry on the initial horizon, the MaramaLabs vision is for its technologies to be adopted across the food and beverage industries and further afield to environmental and wastewater testing. The MaramaLabs team will continue to work from Victoria University of Wellington for the time being, and manufacture the CloudSpec product in Wellington using local engineering expertise. “It’s great to think that we’ve not only been able to create our own jobs out of this tech, but that we could potentially be creating jobs for others as well,” Matthias says. For more information, email Ashwath or call him on +64 4 463 5412. Photo caption: The MaramaLabs team: (L to R) Professor Eric Le Ru, Dr Matthias Meyer and Dr Brendan Darby.